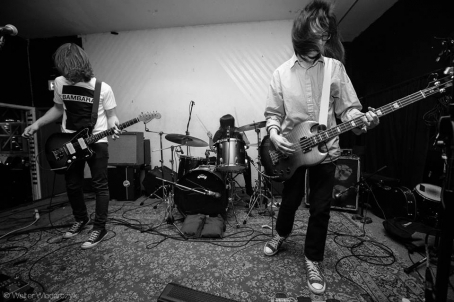 The aggressive grunge punk trio known as Low Fat Getting High puts a bullet bursting with energy, catchy choruses and rough edges right between your eyes. The band has been slowly making a name for themselves thanks to their energetic live shows, and has captured that sort of flare on their latest 4-song EPs: 2013's 'Bad Yoga' and recently released 'Poor Circulation' - a fanzine/EP collectors might want to own (the band's songwriter Michael Sincavage is a skilled illustrator who has contributed with his work to various issues of The Deli). Interesting doors have been opening for the band in the last year, including shows in support of Titus Andronicus, Jon Spencer and Bass Drum of Death, and - on June 24 - they'll be celebrating their (internet) TV debut at the Chris Gethard Show. LINKS: Read Michael Haskoor's interview with Low Fat Getting High.